Claudia is Prospera’s Community Education Director, responsible for all of the organization’s leadership and cooperative development programs. She brings her passion for social justice to her role. She has been an active leader in immigrant rights, gender and violence prevention, gay and queer rights, and health promotion for underserved communities for over 15 years. Using Popular Education, video editing, and culture, she has served the community by creating plays to denounce and prevent social and health problems. 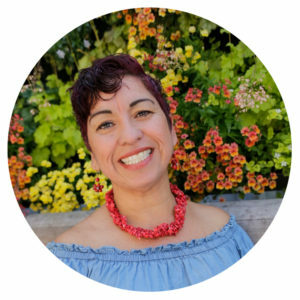 In 2010 she founded the Latino Coalition against domestic and gender violence, La Red Latina that brought together more than 35 organizations that serve, protect and empower Latina women in the Bay Area. Claudia is also the founder of new cooperative enterprise, Nipaki. As an immigrant woman, Claudia has faced the same kind of challenges experienced by many of the entrepreneurs in Prospera’s programs. With a BA in Communications from el Tecnológico de Monterrey in Mexico, one of the most prestigious universities in Latin America, she worked for almost 10 years in the food industry as a waitress. She recognizes that the immigrant community has a lot of challenges to face but at the same time, she also highlights its strength, power, wisdom, spirit and honesty! Hence, becoming a community worker has not been a choice but a need to demand equality and dignity in oppressed communities. Claudia belongs to the Theater Troupe: Social Irruption Theater… Una Piedra en el Zapato. She is active in immigrant rights, loves traveling—has backpacked around the world—and has a beautiful four year old son named Emiliano.